« August’s FNM Promo is Bile Blight! 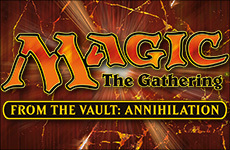 Magic the Gathering From the Vault: Annihilation is Out! Harness the savage power of fifteen of the most brutal Magic cards ever unleashed! These limited-edition, black-bordered super weapons are available in store today! Visit the store locator to find the store nearest you.